Today Yahoo hit Facebook with five big counter-counterclaims designed to invalidate the patents cited in the social network’s infringement countersuit. If the court concurs, Facebook could be left wide-open in settlement negotiations, and might have to pay Yahoo a hefty sum of cash and/or stock. Specifically, the old web portal claims that after it sued for patent infringement, Facebook bought patents “for purposes of retaliation”. Therefore they don’t meet the U.S. Patent Office’s “Duty of Disclosure, Candor, and Good Faith” and should be thrown out of Facebook’s countersuit against Yahoo. Yahoo also claims Facebook broke their agreement to inform each other of IP issues, couldn’t legally know if Yahoo was violating its patents, and that several of Facebook’s new patents were illegally filed. Finally, Yahoo filed two more advertising patent infringement claims against Facebook that look to be quite incriminating. Here’s breakdown of the five claims and how they’ll influence the outcome of the case. Oddly, when Facebook bought AOL patents from Microsoft last week, Yahoo said “Companies who purchase patents are often working from a position of weakness and take these actions to strengthen their portfolio.” However, the two new patent infringement lawsuits it filed today and three of the original ten are based on patents Yahoo itself had purchased in the acquisition of Overture. “Eight of these patents were purchased by Facebook in the past five months, and several of these patents were purchased (independent of any separate technology acquisition or merger) after Yahoo! filed its complaint in this action. On information and belief, many, if not all, of these patents were acquired by Facebook for purposes of retaliation against Yahoo! in this case. No employee or officer of Facebook or any affiliated company conceived of, reduced to practice, or developed the alleged inventions claimed in the eight patents acquired from non-practicing entities. In fact, the applications for many of these patents predate Facebook itself. Since these were bought from non-practicing entities (aka trolls) rather than being originally filed to cover Facebook’s own technologies, they could be ruled to lack “good faith” and be thrown out, leaving Facebook nothing to offset Yahoo’s infringement claims with. Facebook’s self-serve ad tool and Ads API both have this capabilit, and therefore may very well infringe on this Yahoo patent. and Yahoo’s U.S. Patent No. 7,933,903 for “System and method to determine the validity of and interaction on a network” – Essentially this means assessing whether an ad click is fraudelent by looking at the clicks per IP address, clicks in a given time period, and other factors. If these signals indicate a high risk of click fraud, the click is discounted. Facebook very likely uses this or a similar method to attempt to protect advertisers from paying for fake clicks. Contrary to an agreement between in-house counsel for Facebook and in-house counsel for Yahoo! 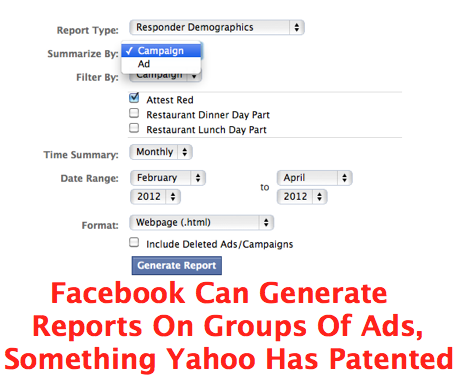 to raise intellectual property issues with each other in the first instance, Facebook provided no notice to Yahoo! of any alleged infringement, and Facebook never attempted to resolve any alleged infringement of any of its patents by Yahoo! prior to asserting them in litigation. Indeed, the PTO did not even issue U.S. Patent No. 8,150,913 until April 3, 2012—the day Facebook asserted it. This break in the agreement, and that fact that Facebook countersued with patents issued and that it had bought that day could lend weight to Yahoo’s previous claim that Facebook’s countersuit lacks “good faith”. Facebook asserted its newly-acquired patents against aspects of Yahoo!’s products for which there is little to no publicly-available information. Unless Facebook has unlawfully acquired Yahoo! confidential business information, Facebook could not have developed a good-faith basis for many of the infringement allegations in its counterclaims. Indeed, when I reviewed all of the patents Facebook was countersuing with, it was difficult to determine their validity of ones like Patent 6236978 because they claimed infringement by back end tech of Yahoo’s. Facebook therefore may essentially be guessing, meaning it “failed to perform a good faith investigation into its counterclaims prior to asserting them” to the court. This could cause several of Facebook’s patents, specifically No. 6,236,978, No. 7,603,331, No. 8,103,611, No. 6,411,949, U.S. Patent No. 6,216,133, and No. 6,288,717, to be thrown out. If the court concurs, these patents of Facebook’s could be thrown out, further weakening its bargaining position in a settlement. In conclusion, Yahoo makes some powerful and well-backed claims today, but it will come down to whether it and Facebook believe a court would throw out most of Facebook’s countersuit. This “good faith” strategy from Yahoo is smart because no patents purchased after its initial infringement suit –whether from entrepreneurs and academics, the bundles it bought from IBM and Microsoft, or even future purchases from Sony or someone else, would save Facebook. Even if the risk of having its countersuit invalidated is low, it could be enough to force Facebook into a settlement.